There were 762 press releases posted in the last 24 hours and 153,554 in the last 365 days. RICHMOND, BC, CA, April 4, 2019 /EINPresswire.com/ -- Vancouver, BC / April 4, 2019 – Durango Resources Inc. (TSX.V-DGO) (Frankfurt-86A1) (OTCQB -ATOXF), (the “Company” or “Durango”) is pleased to announce very positive results from its Induced Polarization (“IP”) survey conducted in four target areas of its wholly owned Trove Windfall-Barry project situated within the Urban-Barry greenstone belt of the Abitibi. 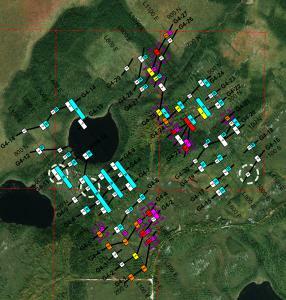 Durango’s Trove Property is interpreted to be underlain by the same Northeast-Southwest structural-geological trend as Osisko Mining Inc.’s (TSX – OSK) Windfall Lake gold deposit. Two of the main regional gold bearing faults (Rouleau and Barry faults) both underlie and intersect on Durango’s Trove Property. These faults also underlie both the Windfall Lake and the Gladiator gold deposits. Faults are known to be a significant control for gold deposits in the area. Durango announced on February 19, 2019 its plans to conduct an IP survey over four main geological and geochemical anomalies on its Trove block of claims, where anomalous levels of gold in tills and/or humus have been found nearby the regional faults described above. The Company is pleased to report the IP survey has been very successful identifying 15 high priority targets based on preliminary interpretation of the IP survey data. Previous work by Bonterra had identified only four high priority targets. Figure 1. Trove Target and location of IP grids based on geochemical (till/humus) and geophysics (MAG) anomalies. 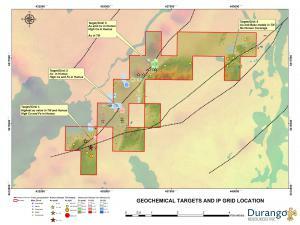 GRID 1 – Four high priority drilling targets are proposed to verify the sources of four chargeable axes. 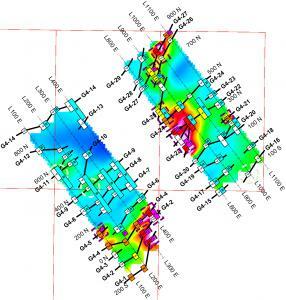 One of them, G1-3 has the strongest chargeability values and is also conductive, and well correlated to the strong magnetic anomaly interpreted to relate to the main fault shared with Osisko Mining Inc. (TSX – OSK). GRID 2 – Three high priority drill targets have been identified on two chargeable axes where sulphides are possible causes for these anomalies. The G2-14 anomaly lines-up nicely with some magnetic anomalies where the main mineralizing fault is interpreted. The G2-17 anomaly, found at the northern end of the lines, is slightly stronger and is conductive/magnetic. GRID 3 – Grid 3 identified 2 low priority targets which will be investigated further during a summer exploration program. GRID 4 – Eight high priority targets for drilling are identified on this grid (burgundy dashed rectangles). Several chargeability anomalies were identified dispersed throughout the area and are variable in strike. Chargeable lineaments G4-1, G4-2, G4-4, G4-5, G-21, G4-22, G4-24 and G4-27 are particularly strong. Figure 2. Grid 4 preliminary IP results and road access. The technical contents of this release were approved by George Yordanov P.Geo., an Independent Qualified Person as defined by National Instrument 43-101. The property has not yet been the subject of a National Instrument 43-101 report. Durango is a natural resources company engaged in the acquisition and exploration of mineral properties. The Company is positioned for discovery with a 100% interest in a strategically located group of properties in the Windfall Lake gold camp in the Abitibi region of Québec, Canada.